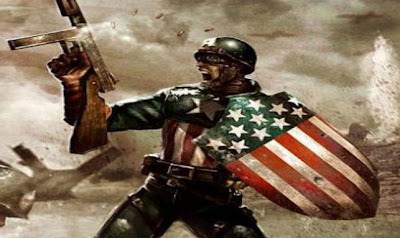 Knowing "The First Avenger: Captain America" is a huge property that Marvel needs to take dire caution with, the studio has been weary of their initial choice for Captain America. Especially after a flash fire of negativity exploded online when Marvel's short list of potential actors was reported by Nikki Finke over at Deadline Hollywood. The reaction left Marvel executives re-thinking their initial stance on having a lesser known talent dawn the Stars and Stripes. A insider tells me that Marvel, "are not finished with all the actors they'd like to screen test." Hence all of the new names that have appeared online as of late. Names including Garrett Hedlund (Tron Legacy), Mike Vogel (Cloverfield), Wilson Blethel (Generation Kill) and Chris Evans (The Fantastic Four). Today both Channing Tatum (G.I. Joe: Rise of Cobra) and Ryan Phillipe (Breach) were reported as also being considered by Marvel. I pushed my insider hoping to see if I might squeeze a frontrunner out of the group, but the only concrete answer I could get was Marvel really wanted Krasinski, but were put off by fan backlash. For me, John Krasinski is still the guy. I'd love to see what he could do with the role. Yes I know I am in the minority, but that's my take. Out of the rest of the names in current contention, you could throw a dart at their pictures on the wall for all I care, just make a decision. None of the names stand out to me. Each one of them is a risk, no matter how you look at it. In other related "The First Avenger: Captain America" news, Deadline reports that actresses Keira Knightley, Alice Eve and Emily Blunt have been approached to play Steve Rogers' love interest Betty Ross. While no decision has been made on Ross, I'd love to see Emily Blunt over Knightley, but I'd bet Knightley is Marvel's top choice.